When we first started PJO Insurance Brokerage Insurance several years ago, one of the first areas that we catered to were contractors. As most insurance brokers will tell you, one of the hardest business sectors to find General Liability Insurance Coverage for are contractors. Our brokers feel that it’s very important to have quality and necessary Clark County, NV Contractors Insurance as a vital tool in gaining new clients, since they will feel more comfortable doing business with your contracting company due to the fact you are insured in case of an accident that may cause bodily injury or property damages. As a Las Vegas, NV contractor, we understand that protecting your business is very important, and having the proper insurance is the first step in doing so. Here, at PJO Insurance Brokerage, our experienced brokers understand that being a contractor in Las Vegas/Clark County, NV can be quite a risky venture considering that when you combine equipment operations, complicated construction structures, and, of course, manpower, there is a high chance that an accident or injury may happen, even if you take every precaution known and follow all the proper safety techniques. Having Contractors General Liability Insurance Coverage is pivotal to protecting your company’s assets from potential lawsuits or claims as well as protecting the livelihood of your business. Now, whether you are a General Contractor or are an Artisan contractor in such areas as Plumbing, Electrical, HVAC, Concrete, Framing, Carpentry, Flooring, Painting, Drywall, or one of the higher risk contractors, such as Roofing or Welding, during a construction project, accidents are bound to happen, and your company needs to be insured to protect itself. Also, as a Las Vegas/Clark County, NV contractor, you need to make sure that the insurance coverage that your company has purchased is coverage that is needed for your area of expertise. In the event that a claim is filed against your company, the last thing your company will need is to find out that the insurance policy that you have has certain exclusions, and, therefore, would provide no coverage for the type of work your company was performing. Contractor General Liability Insurance is vital in any construction business, no matter the specialty. Acquiring the proper Las Vegas, Nevada business insurance coverage is extremely important when you are working on projects as a General Contractor or as one of the numerous trade contractors who may be working on the project. 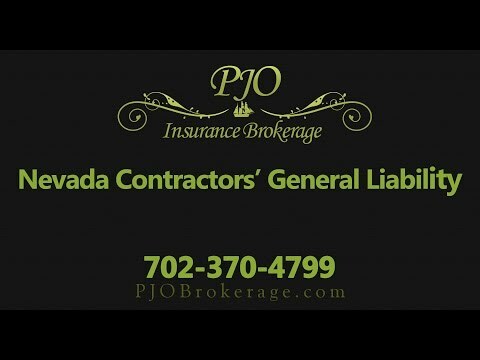 If your Las Vegas/Clark County, NV company is just starting out, or it is one that is a seasoned veteran in the construction industry, and you would like to work with an experienced professional insurance team, we invite you to call PJO Insurance Brokerage today.